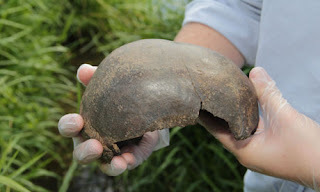 Home » Uncategorized » Neolithic skull fragment discovered on banks of Avon from around the time Stonehenge was built. Archaeologists say ‘exceptional’ find by dog walker near Pershore, Worcestershire, raises more questions than answers. A 5,000-year-old mystery has been sparked after part of a human skull was found on a riverbank. Archaeologists said the unbroken piece of upper skull was in “fabulous” condition with the intricate marks from the blood vessels still visible on the inner surface. “When I first saw the skull, I thought it may have been Anglo-Saxon or Roman but I knew that it was not recent due to the colour,” said Nick Daffern, senior archaeologist. “But we were all surprised when the radiocarbon dating put it at between 3,338 BC and 3,035 BC, or about the middle neolithic period. “It is so well preserved, it is unthinkable that this had been in the river for any length of time which begs the question as to where it has come from. “Myself and a forensic anthropologist believe it is a woman due to the slightness of the skull and the lack of any brow ridges although our conclusions are very tentative because we’re dealing only with the top of a skull,” he said. “There’s no trauma to the bone, and where it has broken those are natural breaks, nor is there any sign of disease so we’ve no idea as to cause of death. The skull is only the second set of neolithic remains to be found in the county, although two large 6,000-year-old “halls of the dead” were found in nearby Herefordshire this year but without any human remains present. By StonehengeNews in Uncategorized on September 1, 2013 .